Another pair of socks finished for the month! This is part of Mina Philips of the Knitting Expat Podcast’s New York Sock Club. 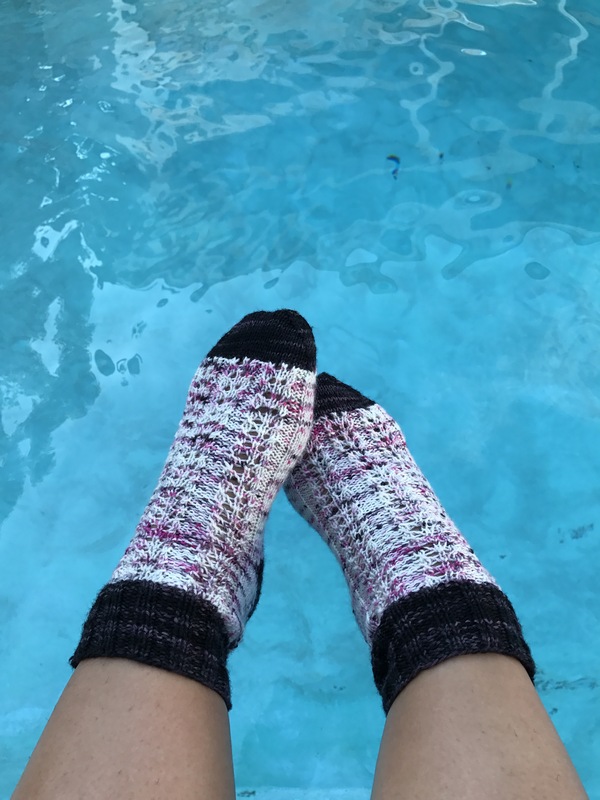 The last pattern will be released on 9/1 and I’m happy to have gotten these socks finished and off the needles by the end of the month. I haven’t chosen the yarn for the next sock yet. I’ll wait until I see the pattern before I do so. I learned through this experience that some pattens work with striping sock yarn or speckled yarn or more tonal yarn so when I see the pattern that’s when I’ll figure out the yarn. Update on the car situation – I was able to connect with the service manager of the shop that needed to “release” my car to the shop that’s actually doing the repair and he said he was going to call the extended warranty after our conversation and do so. Then the extended warranty is supposed to call the repair shop and authorize the repair. All in all – I’m not supposed to pay for the repair! woot! I called the repair shop to give them an update and that was the last I heard. Hopefully, everything is being worked on and I will get a call at some point today letting me know that my car is ready. I have 2 appointments today. One of which I will definitely not go because it’s just too far. I’ll just stay home and get some work done. The other appointment is more reasonable but I’m not sure it will work out time wise. We’ll see how it all goes. I’ve got a lot of work to do and I need the time to do it. Waiting around for a driver to take me around is a waste of time for me. Cute socks! Hope the car is fixed soon! Glad you don’t have to pay for it — that’s always good news!